Today we are off to Redditch, “Lucky you” I hear echoing across the land. Redditch reminds me of the story of a bloke who wears a pair of shoes 3 sizes too small, the only pleasure he gets in life is when he takes them off. As it is with Redditch, the only pleasure one gets from this town is when you leave it. The Poppies can count their recent victories at the Valley or the Psycho Stadium as it is affectionately named, on one finger, and that was in the FA Cup. We did beat them when they spent a bit of time in equally endearing town of Bedworth. If Redditch is the gateway to oblivion, Bedworth is the back door. Maybe the 4G pitch will give us a bit of an opportunity to amend the record book. Once again, we are Pharp-less, today he is attending a wedding and tomorrow he is off skiing in Austria. Already the warning sirens of the Tyrolean Trembler are sounding, the Alpine Horn Society are in danger of being out-horned. Parker arrived at Chez Fuggles around 11:00am, the wind was swirling around the cul de sac, maybe it was a day for the thermals. We went to pick up Citra, whom clearly had a veritable skip in his step as he approached the PRATSmobile. Questioning Citra on his somewhat jaunty saunter, he explained that the Doctor had sorted his very severe case of haemorrhoids, known in medical circles as ‘the grapes of wrath’. His Doctor had prescribed a powerful pain-killing Analgeestring, cutting edge apparently. He had also got his buttock boil sorted, he went to the very expensive private Lancelot clinic where it was duly poked with a very sharp implement. Citra was splashing out big time. Nevertheless, Citra was chirpy with his new-found sprightliness and at least has got to the bottom of his ailments. It was noticeable that Citra landed onto the back seat of the PRATSmobile with a firm thump, not the usual gingerly lowering himself down. The next pick up was our guest of the day, the Poppies very own media guru, pundit, programme editor, Rioja swigger, statistician and dinkie flasher, Cookie, marvellous. 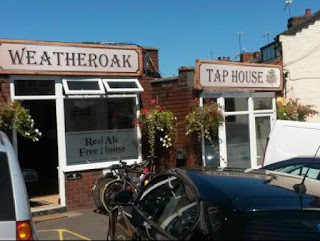 It's was just over an hour’s drive to Studley, home of the Weatheroak brewery tap. We were able to park up right outside what looked like two small former shop’s, which had been converted into a bar, all very nice and cosy if somewhat chilly. The bar area and adjacent snug were about the size of a reasonably sized front room. Most of the cats in the street were swathed with bandages around their heads, clearly the locals had been trying to prove a point. So, to the ales, a great choice of their own ales plus a guest. Fuggles, Citra and Cookie went for Victoria Works, 4.3%, a lovely straw-coloured ale, quite hoppy and very refreshing. Loads of flavour, tasted very much like new world hops, with a zesty finish, Very nice. Parker went for a coffee. Time for another, so we had another Victoria Works. By now two Ellis’s and one Braines had arrived having been on a tour of 10 football grounds, all in a good cause for the Tinhat Fund Selfie competition. The Ellis's sat next to each other, clearly no Braines between them.Time for one more, Citra and Cookie stayed on Victoria Works, Fuggles went for Keystone Hops, a delightful 5.0% pale ale with loads of hops. One of Fuggles favourite ales. Time to move on to the Psycho, not a popular place for most Poppies supporters, many will boycott today’s match as a result of previous encounters with the local Neanderthals. Or maybe it has more to do with our poor records here. The game, well, we put paid to our poor results of the past to bed with a resounding 4-1 victory with 4 well taken goals. Onwards and upwards, or maybe, stay where we are wards. 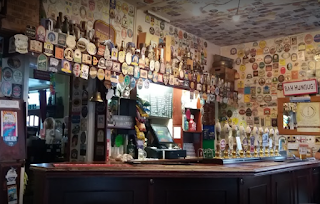 Time for the journey home, we decided not to stop off anywhere but instead went straight to the Alexandra Arms in god’s chosen town, dropping Cookie at home en route. Citra and Fuggles went for Salopian brewery's Velocity, which at first glance at the ale board suggested it was 4.1%. However, on close inspection the list of ales on the board were out of alignment with the ABV% column. Counting upwards and downwards we finally determined that Velocity was in fact a whopping 5.2%, and very nice it was too. Far too nice and strong to be thrashing down our necks at the rate we were. Very citrussy, so as you can imagine Citra was in heaven. We can’t remember what Parker had, it was a golden ale, his first beer of the day. Time for another, Citra’s favourite brewery, slightly ahead of Salopian is Oakham. So, you can imagine the excitement when he spotted the JHB handpump. It went without saying that’s what he had next. I don’t know what Oakham use in their brewing process but their ales are always pristine clear with an inner glow. JHB, Jeffrey Hudson Bitter, ‘magnum in parvo’, a great man in a small. Also relates to the county of Rutland. Jeffery was a dwarf, but that didn’t stop him achieving great things. Just like his ale, not strong at 3.9% but a powerful hoppy flavour, winner of numerous national awards. Very pale ale, straw coloured, lovely. Fuggles settled for a Full Mash Apparition, 4.5% full bodied premium pale ale. Bags of flavour, preceded by good aromas. Very refreshing. Parker went for a half of Kettering’s Purple Cow Hoof-hearted. We had this at the Poppies Beer Festival 2018, very popular, one of the first to go. 3.9% pale ale loads of flavour. Parker committed sacrilege by pouring it into the remnants of his first pint. Air sucking throughout the bar was clearly evident, followed by tuts and mutterings of ‘sacrilege’ and head shaking. Parker was oblivious to his misdemeanour. Just one more beer before home, Fuggles went for the usual Summer Lightning, Citra stayed on JHB. Another good day out for the PRATS, 3 points in the bag, decent ales and another micro-brewery tap to add to the list. Sorted.